That sentence just makes me laugh. Dissolve yeast in water. Add sugar, salt, and 3 cups of the flour. Beat 3 minutes. Gradually add remaining flour to make stiff dough. Knead on lightly floured surface till dough is smooth and elastic. Place in greased bowl, cover, and let rise till double. Punch down, and divide into 8 pieces. Form each piece into ball and place on baking sheet sprinkled with cornmeal. Cover and let rise until double in bulk. Bake at 375 degrees F. for 25 minutes. Cool. Cut off tops; scoop out bread to make a bowl. 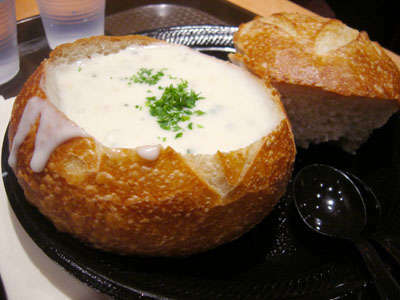 Pour hot soup into bread bowl and serve. After soup is eaten, break off chunks of the crust and eat the bowl. Makes 8 large bread bowls. –The Lion House.